T.M. Cleland shares his artist’s perspective on the practical application of the Munsell Color Notation System, which he wrote for A Grammar of Color, published by the Strathmore Paper Company in 1921. 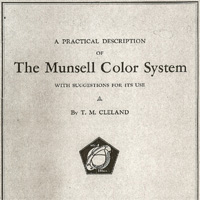 Cleland’s A Practical Description of The Munsell Color System with Suggestions for Its Use was republished by the Munsell Color Company in 1937 and features a foreword by Albert H. Munsell’s son A.E.O. Munsell. Click to read the Munsell Color System by T.M. Cleland.